I first met Tom when I sought him out after discovering his first book The Tao of Democracy: Using co-intelligence to create a world that works for all and invited him to speak to an international gathering of information and intelligence professionals. In my view, his words to that group were as powerful as those of Howard Rheingold and John Perry Barlow, themselves speaking to the same conference a decade earlier. Since then I have read Tom’s second book Reflections on Evolutionary Activism: Essays, poems and prayers from an emerging field of sacred social change, and written my own manifesto, the second book in this series (Tom’s is the third, the first was Manifesto for the Noosphere: The Next Stage in the Evolution of Human Consciousness (Manifesto Series). To the extent that I have been constructively radicalized toward open everything and the core principles of transparency, truth, and trust, I owe a great debt to Tom and the Seattle wizards that I met because of him, not least Jon Ramer, Susan Cannon, and Sheri Herndon. By way of contextual appreciation, I would also mention Harrison Owen, whose first book tom cites but whose most recent book I am compelled to present here, Wave Rider: Leadership for High Performance in a Self-Organizing World, and Peggy Owen, whose most recent book is Engaging Emergence: Turning Upheaval into Opportunity. I am delighted that he also honors Jim Rough (Society’s Breakthrough! : Releasing Essential Wisdom and Virtue in All the People) and the team of Juanita Brown and David Isaacs (The World Cafe: Shaping Our Futures Through Conversations That Matter among many others. Tom provides both an appendix of key concepts with links for each that I have remixed and posted to Phi Beta Iota the Public Intelligence Blog, and an excellent list of books that I am also posting with links. The triad is easily found online by searching for Tom Atlee Public Wisdom Trilogy. 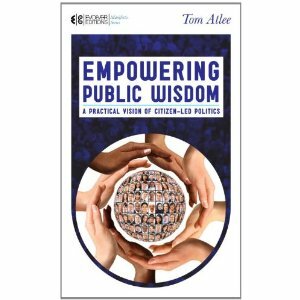 Although I am moderately familiar with Tom’s thinking, both as published in prior books and on the Co-Intelligence Institute website, this book is a capstone work, one that brings all that Tom can offer–and all that Tom has ingested and integrated from many many others that he credits in the bibliography. If I had the means, this is the one book that I would encourage all citizens to buy, read, and then discuss, first in block parties, then in neighborhood meetings, and finally in Town Hall gatherings that every elected official is required to attend (with their mouths taped shut and all electronic devices confiscated at the door. As I went through the book, appreciating how it weaves an integrated mesh, I am constantly surprised by new insights and refreshing restatements of old core ideas in a new context. No matter how much you might have mastered many of the works that Tom respects in his bibliography, this is a new work, taking us to a new level. Of course if you are just recovering from having drunk the kool-aid and gone along with criminal insanity at all levels these past few decades, then this is a positive, constructive book with which to begin your return to moral sanity. For those who are interested in a larger context — the strategic positives and negatives within which we must all learn to act with detachment but also with purpose, here are two lists of my book reviews across Amazon (reading in 98 categories), and a third list of reviews on books about intelligence. I am one of the champions of public intelligence in the public interest, and while Tom does not address that aspect, I am quite honored to be in his company, and see that the Amazon list of books that customers for this book also viewed, is as perfect as it could be.